Freight Trucks That Followed The Freight Wagons. Freight Wagon On Cariboo Road. Freight Wagons And Machinery At Yale. Freight Wagons And Teams At 115 Mile House, Headed For Ashcroft. 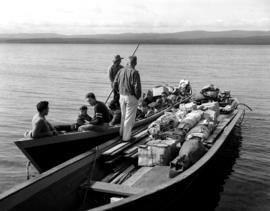 Freight Wagons Leaving Wright's Ranch, 127 Mile House At Lac La Hache. Freight Wagons Unloading In Yale At Strutt's Blacksmith Shop. 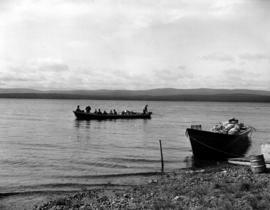 Freight bateau at Fort McLeod; McLeod Lake. Freight lying at Thompsons Landing, B.C. Freight outfit at Soda Creek. Freight sled on the Nechako Road at the Mud River Bridge. Freight team at 59 Mile House. Freight team on the Cariboo Road. Freight team on the trail between Peace River Crossing and Grouard. Freight team passing 150 Mile House. Freight teams of the Columbia River Lumber Company. Freight wagon along the trail from Peace River Crossing to Grouard. Freight wagon at Clinton, BC.